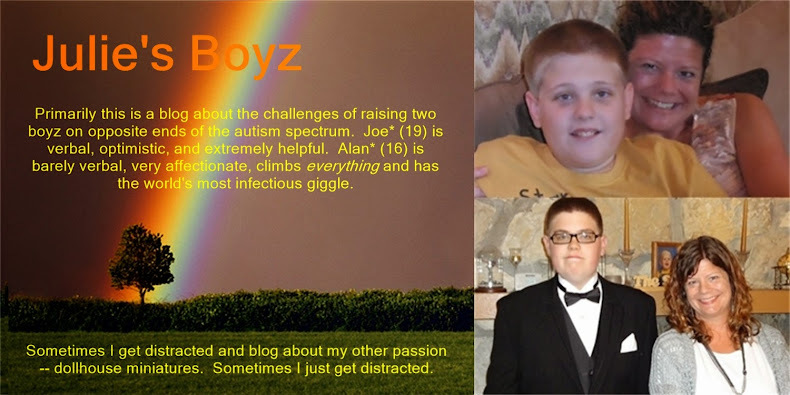 Julie's Boyz: IEP's ... the Good, the Bad and the Ugly! Individualized Education Plans (or IEPs) are something every parent of a special needs child has attended. Being in my 26th year of special education parenting (15 for Joe and 11 for Alan), I have attended more IEPs than I care to remember. Some are good, some are hideous, many are frustrating and some are a complete waste of time. Today's was Joe's transition to adulthood/post secondary education. It was both good and frustrating. The SLP (Speech Language Pathologist) brought up the fact that when Joe gives an answer to a question and it isn't exactly the correct answer, he struggles with constructive criticism. OK, to be fair, NO ONE likes constructive criticism, but it is a fact of life. When Joe was younger, his response when he was angry was to take off his glasses. I think this originated from the girl in A Series of Unfortunate Events tying back her hair when she was inventing, but I am not positive. He doesn't always do that these days. Most of the time he just goes to the bathroom. This is actually better as it gives him a chance to get away from the situation and calm himself down. Unfortunately, this might interfere with competitive employment (our post-secondary goal) as he can't exactly run off from his boss to use the restroom every time he is told how he could improve. Still, overall, Joe's outlook is so much brighter than Alan's that sometimes it is frustrating. While I spend a lot of time wondering if Alan will have to be institutionalized, I only have to worry whether or not we will have to support Joe for the rest of his life. One of the worst IEPs I ever attended was when Alan was in first grade. First a little background as to the events proceeding the IEP in question. Alan was always a big "headbutt-er" and he got away from his aide one day in October and went up to a gen ed teacher and headbutted her. When I got the phone call later in the day, all I was told was that he had "headbutted a pregnant teacher". What is everyone's first thought when they hear that phrase? It is of a child (at the exact right height) running up to a woman 6 months or more pregnant and slamming his very hard head into her stomach, right? I was appalled and horrified!! It wasn't like this was a new behavior!! Although there was no Behavior Intervention Plan at the time. I was still a bit upset that he received a one day out of school suspension and a four day in school suspension -- not about the in school portion, mind you, only about the out of school portion. First off, this happened more than 24 hours after the actual incident. These kids need instantaneous feedback. Second, a day off school is a reward. Why in the world do they give the child misbehaving a day off school?!?!? DH: Why did Alan get an out of school suspension for this incident? Principal: We need to keep our teachers safe. DH: So why give him an OOS suspension when that is essentially a reward for him? Principal: Well we need to keep our teachers safe. DH: I understand that but how is reinforcing a behavior going to help keep your teachers safe? Principal: We have these laws and rules to keep our teachers safe. I am just glad I had left the IEP by this point, or I might have headbutted someone myself! The end result was the principal decided that Alan was never to leave the autism room unless he was accompanied by two aides. They didn't hire another aide so what would you do as a teacher? Send Alan into a classroom with two aides and keep two students back in the autism room or send two students out with individual aides and keep Alan back in the autism room? Needless to say, Alan didn't get into gen ed much after that and we switched schools at the end of that year. As a postscript on this whole event, I found out at the Winter Party that the teacher in question was headbutted on the hip and that she had only just found out she was pregnant!! Not only could Alan probably have headbutted her on the stomach without hurting her, but it wasn't like he was targeting the pregnant lady -- which was the impression I received the entire time we were discussing the incident during the IEP!